Minerva’s Cafe is my own personal site in the Chilbo teaching community. The outdoor cafe can be used as a teaching or conference space, and the interior is used for posting class notices, examples of class work, and assignments. Upstairs is a private area with posing stands where students can practice assembling their avatar clothing and appearance. The bulletin board inside the cafe has an example of a class field trip. By clicking the board, students receive a notecard which contains a link to Virtual Ability Island, as well as questions to guide them in their research. 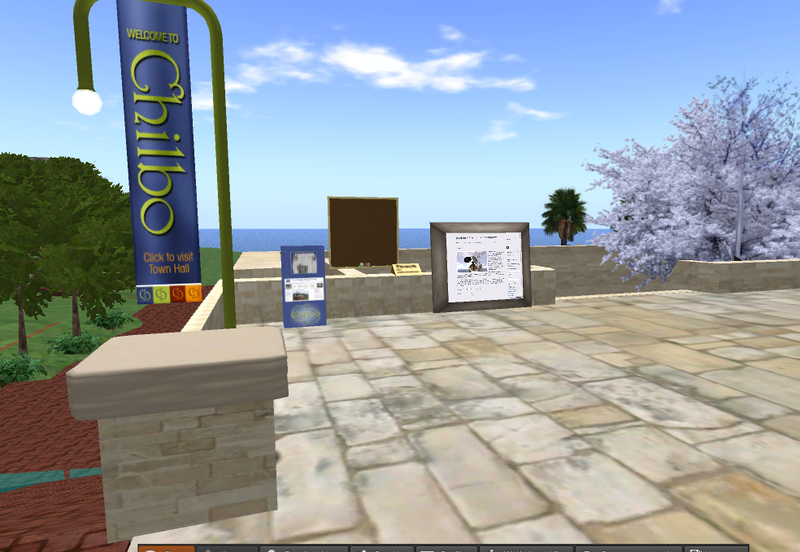 The assignment helps students understand the basics of Second Life, and at the same time they learn about the disability community in virtual worlds. This assignment is available for anyone who would like to try it. In the courtyard there is another bulletin board, used for communication with the teaching community. Sometimes I post notices of interest to teachers there, and If I am working on a new tool I sometimes leave out a copy for others who would like to try it.